Old Christmas cards make great gift tags. Punch a hole if you have a hole punch, thread a string through on a needle, or fold a rectangle in half to make a tiny card that you can attach with tape. If you don’t have old cards, any nice-looking piece of paper will do. Or try plain brown with the top corners cut off for a retro look. Whenever I come across a nice print, I file it away for future use. (Literally; I keep them in a manila file on the bookshelf.) My favorite teas come in gaily printed boxes, so I store those flat and bring them out when I gift-wrap. It’s hard to see in this light, but these are all embellished with silver sharpie. If you (or your children) have stamps, that’s a fun way to liven up packages. You don’t need strictly Christmas-themed designs, either; toys, nature, animals, fun characters, and abstract squiggles are all great ways to add visual interest without adding to the landfill toll. If you have an existing box, a pretty picture or two from an old card or a box of tea may spruce it up into a gift box, requiring nothing more than a bit of glue. I didn’t go into my scrap stash looking for a rose to go with Ten’s sonic screwdriver. It just happened. Most of my ties are ribbons that came to me on other presents, or starry tinsel garland sent to me years ago. I didn’t buy any of the ribbons pictured here. If you tuck whatever ribbons come your way into your box of wrapping supplies, you may be all set for next year. Or just buy a roll; you can re-use the same pieces year after year. For a more homegrown/low key/natural look, try kitchen string or twine. Colored crochet cotton produces a similar look to the baker’s twine that’s so popular now, and may be cheaper, depending where you get it. For wrappings made entirely of reclaimed materials, try tying with t-shirt yarn or strips of torn muslin. Natural elements take your gifts to a whole new level of classy without costing you a cent. Chop those branches that wouldn’t fit into your tree stand into cute twigs. Forage for holly, evergreens, leaves, cones, and sprays of berries. Tie on a twig or spray with ribbon or string. Wow your in-laws with your packaging flair. You can tie almost any item to a package: bells, broken/old jewelry, ornaments, buttons, beads, small toys, small animals*. Go wild. * Okay, can doesn’t necessarily mean should. But you get the picture. The principle is good for all of these wrapping strategies: some snowy afternoon when your kids/you are stuck inside, prep your wrapping supplies for the season/foreseeable future. Cut scrap fabric into large squares for furoshiki (Erin of Reading My Tea Leaves uses unhemmed muslin for an old-timey look). Have your kids draw on/stamp/glue things to/maul (depending on age) some paper or kraft paper (this goes over particularly well with grandparents). If I’m in the mood for a quick, easy craft, I’ll cut all of my scrap fabric into neat rectangles one day, and sew them all some other time when I’m feeling restless. Sewing bags is a great craft for a child learning to use the sewing machine, too, as it’s all straight lines and medium-sized pieces. And as the same bags reappear year after year, your child will have the satisfaction of knowing he/she made that bit of family tradition with their own hands. Win. It is a truth universally acknowledged that most crafters, having committed to making an unreasonable number of their Christmas presents, do not have a great deal of time for this sort of thing in December. Thus, the making of bags and wraps is a particularly good exercise for the doldrums of January and February, when you suddenly have much less to do, yet still can’t do much outside. If you end every holiday season with a resolution for everything to be Less Complicated next year, having a supply of bags on hand to shove the presents into and tags all set to tie on come December may save you some angst. Plus, the Christmas fabrics and ribbons are mad cheap starting December 26.
drawstring bags that once held sheets, etc. Or use what you have. Your kid has two sets of superhero pillow cases? Bam. The ones not on their bed can go under the tree. Superhero gift wrap, superhero mom. Got a present that’s too big for any roll of paper? Wrap it in a blanket and top with a giant tag and a bow. A book with fabulous tutorials and pics: Ruby Star Wrapping: Creating Packaging to Reuse, Regive, and Relove. Did I miss out your favorite wrapping option? Tell us all about it in the comments. Disturbingly, wrapping paper and bags account for 4 million tons of trash annually (source). On the upside, we don’t have to do it. According to the same source, “If every American family wrapped just 3 presents in reused materials, it would save enough paper to cover 45,000 football fields.” Let’s be those people, okay? Needless to say, this waste sits very poorly with the sustainability I want for my lifestyle. I’m not giving up hot showers just yet, but I really can’t say that my failure to buy rolls of garishly printed shiny paper has caused me much suffering, or even any loss of festive-ness in our Christmas season. Some minimalists forego presents altogether, but we’re not quite there yet. I love giving and receiving presents. Small presents, big presents, presents that climb on rocks… Sometimes the presents are things someone needs, even if he doesn’t know it: a thrifted spring jacket to replace one that’s worn out, a homemade waterproof bag to carry his shoes home from work instead of an old plastic bag. Sometimes they’re just nice. Like books. Or beer. Or chocolate. Mmm, chocolate. I love wrapping presents. I love seeing the presents grow under the tree as Christmas approaches. This is unlikely to change. What have changed are the wrappings themselves. Here are a few ways to do Christmas without doing wrapping paper. I’ll tell you now, they’re all easier, cheaper, and/or more fun than that shiny paper on the roll that always rips when you’re in a hurry. Brown paper (oddly called ‘kraft paper’ on teh interwebs) has been staging a comeback. Once the wrap of choice for any kind of parcel (in the days before single-use shopping bags), it was eclipsed by purpose-made ‘wrapping paper’, but no more. If you live in the US, paper bags are a sturdy option. The UK doesn’t seem to favor paper bags. I am, however, graced with an abundance of brown paper whenever I open a package from amazon. Heaps of paper. Festoons of paper. For extra fun, embellish with colored pens or markers, or kick it up a notch with silver and gold sharpie. Anyone can draw a tree or a snowflake. Just take it one line at a time. Junk mail is the worst. My little environmentalist heart just bleeds every time a giant flyer goes straight from my letter bow into the recycling bin. (It would bleed even worse if I read the flyers, though.) But there is a bright side, at least for bright adverts! Things that are printed in bright colors and patterns look equally bright under the Christmas tree. Or if you’re aiming for a more subdued, classy look, go for plain black-and-white newsprint with red string, ribbon or tags. My subversive little self also enjoys using promotions for commercial Christmas junk to avoid having to buy wrapping paper. It just warms the cockles of my heart. A few months before Christmas, I start keeping an eye out for magazines with nice pages. This year’s stars were a lovely glossy sales magazine from a supermarket, a fundraising catalogue from the John Muir Trust (some lovely wild landscapes in that one, naturally), and the Christmas edition of the Historic Scotland magazine. The full-color, glossy turkey and bright red lobster were a big hit at the St Nicholas* gift swap this year. The winter edition of any catalogue should have some great, glossy pictures. If you don’t get catalogues (email me to tell me how you manage it), ask friends for theirs. Seasonal supermarket circular. I would pay money for a paper with the wine bottles, if I weren’t getting it for free (and opposed to wrapping paper). *In the Netherlands, St Nicholas’ Eve, the day before the saint’s day of St Nicholas, is the major December holiday. It’s become a tradition for our Dutch friend to throw a party featuring a most fabulously convoluted gift swap game. Much better than your standard white elephant swap. Whatever approach you take to textiles, it’s an extra gift on top of a gift. And if you go about it right, it can still cost less than buying wrapping paper at the shop. And for 2 of the 3 options, no sewing is required. There are two ways to go about this: buying fabric for the purpose, or using what you have. Mama K. uses leftover bits from her quilting stash. I use outgrown or unloved clothes. It doesn’t cost me a penny. If you’re buying, check the clearance rack—anything red, green, gold, or cheerful will work. Putting a big red bow on any color will make it look Christmassy. If you have a lot of forethought, you can also hit the sales right after Christmas for those seasonal prints. Or hit charity shops to get huge yardages for very cheap, as sheets, duvet covers or curtains. Wrappings that are cheerful but not obviously Christmassy (such as the polka dots below) can be used year-round; add a big red bow for December, or a coordinating bow for a birthday. If this is the first year you’re experimenting with fabric wrappings, this is the simplest approach. Take a rectangle of fabric in an appropriate size and wrap your present as you would with wrapping paper, tucking the raw edges under if desired. Finish off by tying ribbon or string around the folded-down ends of the package to hold the cloth in place. Alternatively, roll the gift in fabric like a giant hard candy and tie at both ends. Or cut a large circle of fabric (hemming optional), place the gift in the middle, and tie the fabric on top, like a gift basket. This is my favorite option. If this is your first year using them, it takes a small outlay of time. In subsequent years, though, you just pop the present in the bag and you’re done. The bags are infinitely reusable and so darn useful. Mama K. made some to hold some of our wedding presents, and we’ve been using them for years to hold dance shoes, laundry, and various other household items. Erin Boyle of Reading My Tea Leaves uses similar bags to keep her tiny house organized, as do I. The best kind of stuff is the stuff you don’t have to look at. If this looks like the leg of my pajama pants, there’s a reason for that. Clothes often have hems and seams that can be used to save you some folding or sewing. Pant legs, for example, already have vertical seams, and a hem if it’s not too worn out. Skirts usually have good hems. A slight curve really isn’t a problem. This bag still has the original dress hem. I didn’t even cut it into a perfect rectangle, just cut the skirt in half down the side seams. You can’t tell on the present. To remove height, fold the top down inside the bag before tying. The wrapping on the small package above uses both of these techniques. The art of wrapping gifts in fabric is hardly a new one. The Japanese have long used a square of cloth called a furoshiki both as a gift wrap and a very adaptable carrier bag. These are available for purchase, or make your own by hemming a large square of fabric. For small gifts, a thrift store scarf or a bandana will serve the same purchase. Consider printing out a visual guide to using a furoshiki and slipping it in the present so that the recipient can enjoy using the furoshiki in their daily life. Keep it in the family. If you’re using these bags for your spouse or children’s gifts, you only have to make them once, and you’ll be all set on wrappings more or less forever. Instead of putting a trash bag by the tree, put a box to keep the wrappings in for next year. They’ll become a well-loved tradition, like your stockings and ornaments. And the kids won’t come running for scotch tape come next Christmas. Give to like-minded friends. Mumsy and I have been using the same gift bags back and forth for a couple of years, tied with pretty ribbons. If the recipient passes the bag on to someone else next year, you’re spreading the good word about reusable gift wrap without a sound. Enjoy giving an extra gift. If the recipient is the kind of person who will use a gift bag around the house, the extra organization is an extra gift. And unlike paper, it’s still not going in the landfill. Yay! If the recipient doesn’t fit any of the above categories, perhaps some recycled paper wrapping is in order? Sure, my wrapping paper is made of pictures of Scotland. Isn’t everyone’s? There’s even a label printed right at the top, in case you hadn’t figured out that they’re ‘pretty wrapped gifts for under the tree’. That way you don’t accidentally put them in the kitchen instead. The best part is, I was just wrapping that present as though it were regular wrapping paper. The front-and-center declaration came as a surprise–I went to take the pictures, and there it was! I can’t say I ever read her site, but her quote just touches me right where it counts. In the cereblog cortex. In other news, I have owls! I would do a tutorial, but… well, why not. For the short version, skip to the bottom. 1. Find an owl template online, or trace the pictures above directly from your computer screen onto tracing, printer, or other thin paper. This is how I get most of my patterns, being too cheap to buy a home printer. I’m considering it, though, now that I’ve definitely been accepted for my PhD program here. I’m that lazy that I won’t take the extra twenty minutes to go to the Linguistics building, log into a lab computer (which takes about a year), and print. I think they’ve recently moved to a cloud-based system, though, which would mean I can print from my laptop. We’ll see. Although tracing patterns from the computer means I get only the outline I need and don’t have to fiddle with the scale controls on the printer, so it works quite well. Confession: I actually free-handed the owls above, since the shape was pretty simple. I didn’t even draw them first, just cut the fabric. I did trace a pattern for the giraffe pillow last week, though. 2. Pin two small pieces of fabric, right sides together, and cut out the owl shapes. If you trace the shape directly onto a layer of fabric, make sure that any lines end up on the back side of the owl, since no edges are turned under during this project. Not like a pillow. Each owl requires two cut-outs. 3. 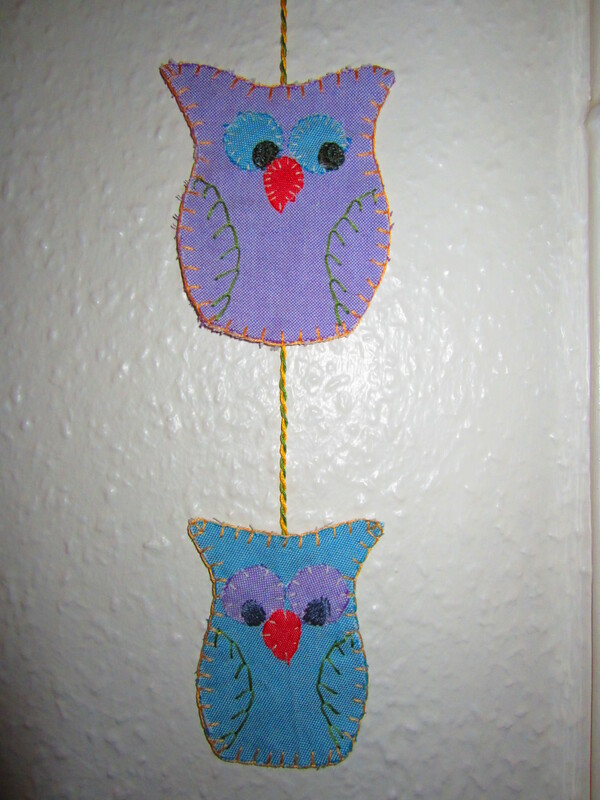 Cut out two circles for eyes and one beak per owl. Freehand it. 4. Blanket stitch the fabric pieces together; use parallel whipstitch to attach eyes and beak. Alternatively, use any decorative stitch you like. Find a nice environment, filled with friends or Jane Austen movies, to do your hand sewing. My chosen locale for this project was a nice game of Arkham Horror. Hand crafts like small sewing and knitting make me much more patient during board games. 5. Outline pupils with backstitch and fill using your favourite filler stitch, such as satin stitch. This is my very favourite site for learning embroidery stitches, filled with informative pictures. Because it’s quite difficult to fill an area with satin stitch that’s bounded by the unraveling edges of the eyeballs, I think that if I were to make more owls, I would use something solid, like buttons or small fabric circles, for pupils instead. Or perhaps a radiating stitch instead of a parallel one. 6. Outline wings. I used a one-sided feather stitch to suggest feathers. Adding wings really made a difference in the appearance of the owls, putting them firmly on the correct side of the owl/furby divide. 7. 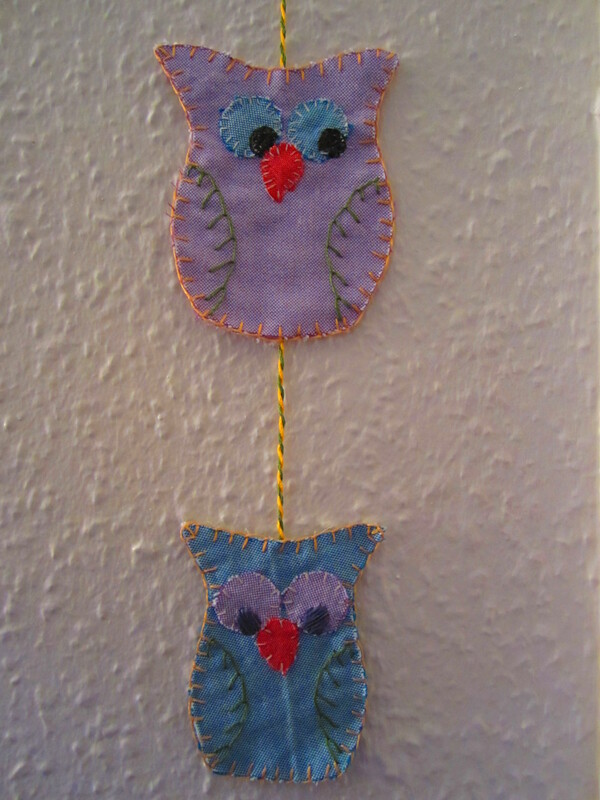 Attach a cord (mine was made by twisting together two pieces of embroidery floss) to the back of the owls using a few stitches. Make a loop in the top and secure by wrapping the joint in thread and cutting off the dangling end. Or just tie a knot. Be creative. I think this ‘tutorial’ took longer to write than the owls actually took to make. Well, not quite, but you get the picture. 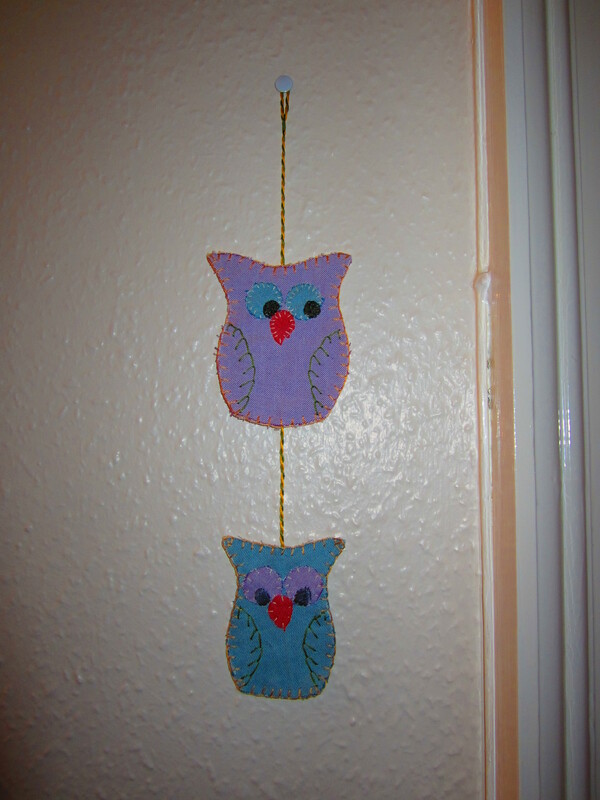 Short version: cut out owls, stitch together with favourite stitches from this site, string on a cord. This is also the recipe for the embroidered hearts in my living room and for my Christmas ornaments. The kick in the pants to start this project came from this blog, but I had been planning the project for a while, since owls are all the rage these days. The graduating sizes were inspired by a similar project in stained glass (plastic) in a local shop.